so said ellie: Test-kitchen weekend. Test 2. Finally. Cupcakes. AKA Test Two. 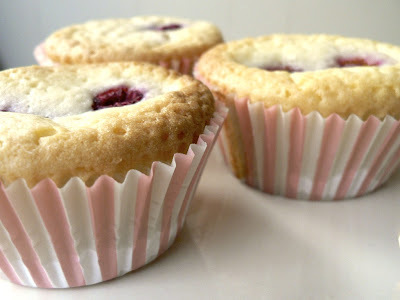 They started out as White Chocolate Mud Cakes, from the Women's Weekly Cupcakes & Cookies but due to my somewhat free-spirited approach to recipe following, ended up as a kind of hybrid cupcake-muffin loaded with raspberries. Don't worry, it was intentional. And it is test-kitchen weekend after all! 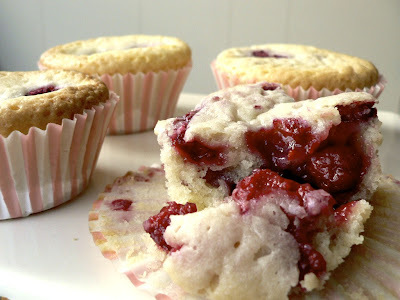 Hybrid White Chocolate & Raspberry Cupcake-Muffins. 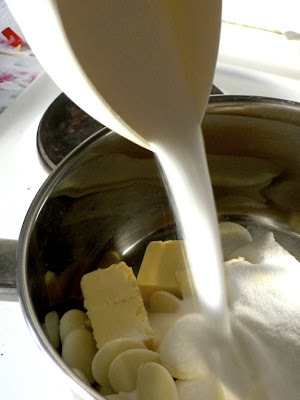 Combine butter, chocolate, sugar and milk in saucepan over low heat. Stir until well smooth and glossy, but don't boil. 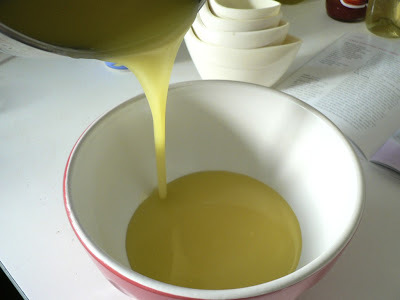 Transfer mixture into a bowl and cool for a little while. My bowl is small and awesome. Small because the amounts above make a half quantity, and awesome because it's one of my new set of super lovely nesting bowls. A nest! Made of bowls! 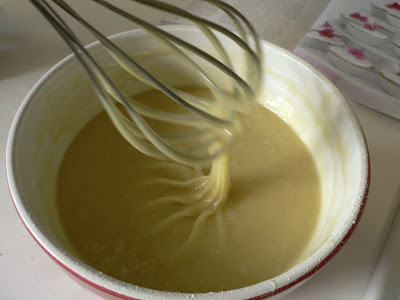 Whisk in the flours, then the vanilla and egg. 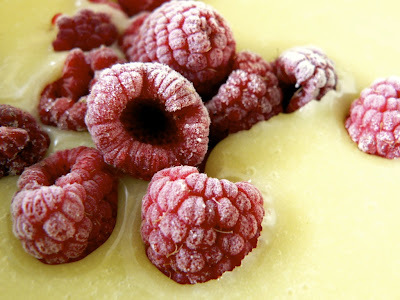 Stir in the raspberries. I tried to break them up a little bit so I would get a bit of colour. It didn't really happen. Fill up your papers. I filled mine very full and was worried about cupcake explosions, but it was ok. They stay quite flat. Bake for about 35 minutes. 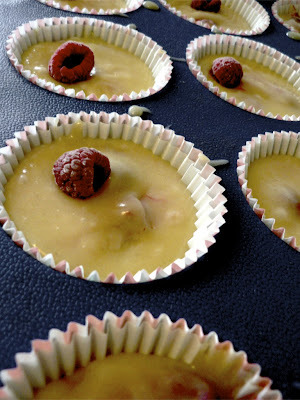 Mine were closer to 40 minutes, the extra moisture from the berries makes a difference. 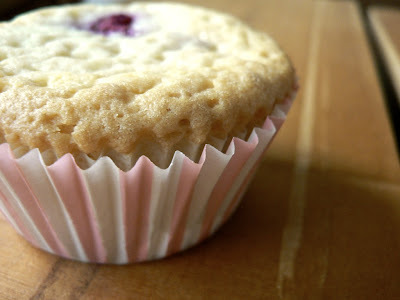 Part of the reason I was testing this recipe today was because I want to make raspberry & white chocolate cupcakes for my lab very soon. My plan for those ones is to make the buttercream with raspberries and not have any in the cake, but I wanted to see what this cake would be like as the base. Next time I'll cut down on the sugar big times, maybe by a third, because these are reeeeally sweet. I can't imagine how sweet they'd be with the marshmallow frosting that accompanies them in the book! Also, I'll leave the raspberries out of the cake. 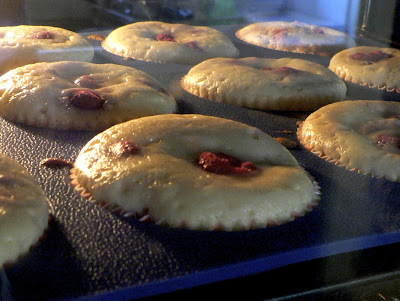 They're super delish (especially warm), but make the cake quite unstable, which would make frosting a little difficult.